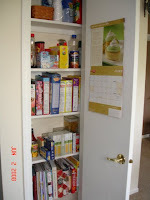 Yesterday, I spent the morning organizing our kitchen pantry. It is small, but I am trying to get more organized and throw out things I never use. So, here it is so far. I still want to get a few baskets in there. Not exciting, but atleast it is organized! Afterward, I organized all of the rest of my cabinets. I still need to work on the refrigerator. I was hoping I would have a new one by now, but that will have to wait. I am sure we will eventually get one. Today, I cleaned the kitchen and vacuumed. I am waiting to hear if we will have softball tonight. There have been some thunderstorms going through, so I am not sure about tonight. They should call by 4 to let us know. Last night, we had our Whole Foods organic ground beef. I have to say, I loved it! It tasted great and I loved the texture. I will be buying more meat from there next week. It is so quiet here!